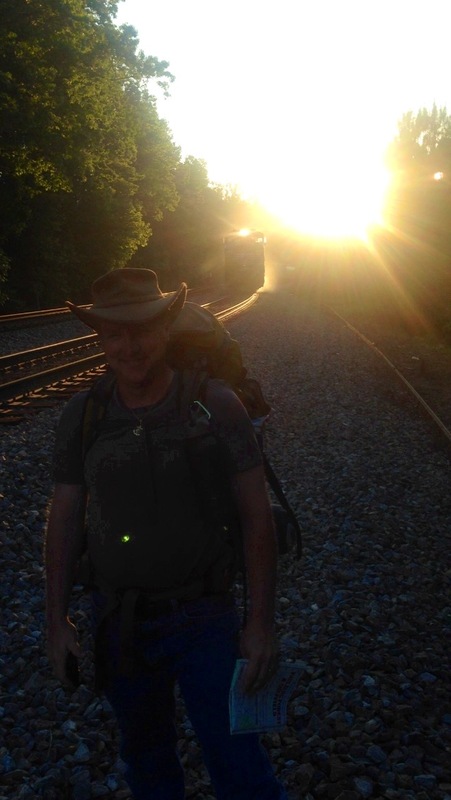 Here is a quick story of a hike John Rakestraw and I did May 26 & 27, 2013. It was already about 6:30 PM when I saw the text from John asking if I wanted to go camping that night down at Raccoon Creek, close to our house on dads land. John and another friend of his had camped there on Friday night. Temps were in the mid 40s, very cool for May. The state stocks the creek with trout, John and his friend had caught some and grilled them for dinner. His buddy had to leave early and he text me on Sunday afternoon before Memorial Day. After a few texts back and forth and a call to Wendy, I was ready to go. I got my bag together and out the door I went. Once I was at Johns, I proposed a deferent destination. It was still on Raccoon Creek but several miles up stream in the WMA behind Friendship Church, a small church in our association of churches. I have wanted to do more exploring of the forest around the house and thought this would be a good opportunity. I have a map of the area and have been studding for some time. I had seen a spot on the map with what looked liked big flat bottom land next to the creek. Looked like a good place. Looked easy to get to also. There is a road from the Church to a branch that we could follow to our spot. John was up to it so we were off. We parked at the gate next to the church, grabbed our packs and the map and hit the dirt road. The forest had been cut for timber about 15 years ago and just a few years ago the planted pines were thinned by cutting about 60 percent of the trees down for pulp wood. So the road we were walking was in good shape and open go the sky. We saw two hen turkeys right a way. We took a side logging road to the right that leads to a set of two rail road tracks. I had been to this area once before when I wad very young with dad. I remember walking down to the tracks from the Church and putting pennies on the track. I don’t know why we did it there. John and I had fun exploring the track. After a few minutes of walking down the track a train passed us and we got some good photos. The tracks crossed our branch we followed down to the creek. So we left the RR at the crossing. As we got to the bottom of the hill we fount a huge tunnel that our branch flowed through under the RR. It went back about 70 feet then turned to the left so we could not see the other side. It was big enough to dive a truck through. We stated following the stream down. It was very pretty with rock cliffs and out cropping. Then it would open up to large bottom land. Light was fading as we scared up a groundhog. We made it to the creek just as it was getting dark. The stream we were following had gotten bigger and was not so easy to cross. We thought we needed to cross one more time. There was a log that went most of the way so I took a few fast steppes and jumped the rest and made it okay. John did the same. We now needed to cross the creek. No easy way was seen. John tried to wade it but it would have covered his boots. We walked up steam a little way but the hills quickly got too step, falling into the creek, so we turned back looking for some way across. We saw a tree with munity trunks leaning over the creek. The idea was to use one of the smaller ones as a way across by hanging from it and walking our hands up the trunk and the tree would then bend over and when we cleared the water just drop off. I started across and didn’t get going good before my hat fell off. I had already lost one $50 hat on the lake when we had rented a boat for the day. I was taking photos of Sarah driving the boat and the wind took it. It had sank by the time we got back. So I did not want to loss this one. I dropped and hit the water. As fast as I was in, I was out looking for my hat. I dropped my pack on the sand bar and started down stream. I got my flashlight out and saw the hat on the bottom in three feet of water. Shoes off, socks off, paints off, underwear off and into the creek after my hat. Got it. While getting dressed I heard a big splash up stream. John got tangled up with some roots and went down in the creek. He was total wet. I finished getting dressed and John fount a good spot to make camp. I gathered wood while he got his wet cloths off. 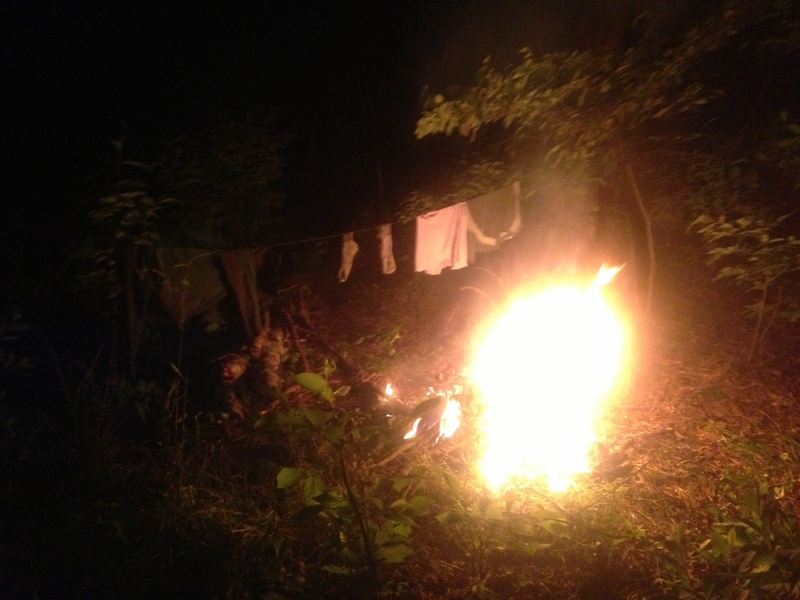 We set up a line to dry our cloths next to the fire. We set up out hammocks, John sported his Eons Christmas lights. There was an old deer stand close by and I borrowed the set cushion. John had his camp chair. We ate our Mountain House meals and keep the fire feed. Most of John’s cloths were dry by the time we went to bed. My paints were a little wet so I let them dry over night along with my socks and shoes. We woke up around 5 AM to the sound of something walking in camp. When I asked John if it was him, we heard a deer blow at us. I went back to sleep and did not wake back up until 8 AM. I got up and got the fire going again. I ate my Pop Tart and John shared some coffee. We broke camp and I returned the seat to the deer stand. We used an old ladder that was a deer stand at one point to make a bridge back over Raccoon Creek. We followed the smaller branch back up stream to an old logging road and took it up hill. It was a real clime out. Once on top of the hill we were in the cut and the sun was already hot. It was a 50 minute walk back to the truck. Turned out to be a good little hike that was only about 5 miles for our house.